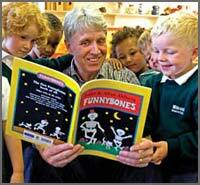 Allan Ahlberg (born 1938) were a British married couple who created many children’s books, including picture books that regularly appear at the top of “most popular” lists for public libraries. Janet was born in Yorkshire and brought up in Leicester. The Ahlbergs met while enrolled in a teacher training course at Sunderland Technical College and married in 1969. They worked together for 20 years until Janet died of cancer in 1994. Allan wrote the books and Janet illustrated them. Allan dreamt of being a writer – although he didn’t actually write: “I had all the romantic notions of the white suit and the panama hat – all the Somerset Maugham images without any words to support them.” It was Janet who opened the lock. Janet and Allan Ahlberg were married and settled near Leicester. Allan was working as a primary school teacher and Janet had started illustrating. She asked her young husband to write her a story. 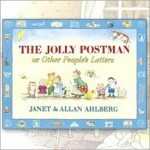 Probably the Ahlbergs’s greatest success was The Jolly Postman, published by Heinemann in 1986; Allan Ahlberg told The Guardian in 2006 that it had sold over six million copies. It made innovative use of envelopes to include letters, cards, games and a tiny book. These books have all become children’s classics, with their rhythmic prose, their mix of dottiness and sentiment appealing both to young children and to the parents who read them aloud. Allan has authored of more than 140 published books, including two in 2004 illustrated by his daughter Jessica, who is a professional illustrator. Father and daughter have collaborated again, completing a movable picture book published late in 2012, The Goldilocks Variations (Walker), “a new twist in an old fairy tale”. Since Janet’s sadly premature death in 1994, Allan has continued to work, recently producing his beautiful tribute to her, Janet’s Last Book, and continues to create wonderful books for children of all ages. • Janet won the 1978 Kate Greenaway Medal from the British Library Association, recognising the year’s best children’s book illustration by a British subject for Each Peach Pear Plum. • The Jolly Christmas Postman (1991), for which Janet won her second Greenaway Medal. • 2007 Each Peach Pear Plum was named one of the top ten winning works for the 50th anniversary of the Medal (1955–2005).